By S & S Foundations Pvt. Ltd.
How Far is S & S Sarvam? Spreading over an area of 6 acres, well planned with a decent amount of amenities which are both luxurious and lavish. Ready to occupy 2.5BHK and 3BHK Apartment for sale in Velachery with a wide carpet area range, built on a CMDA Approved layout. 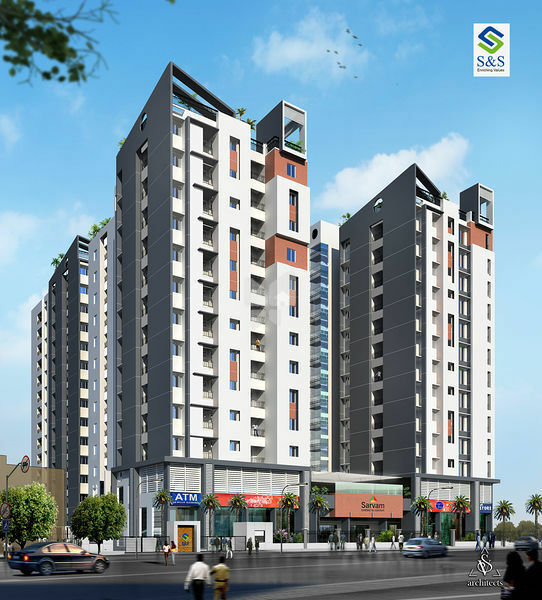 Sarvam features as one of the finest Velachery apartments for sale that embodies all the essential aspects of exquisite living from S&S Foundations Pvt. Ltd. Defining the standards of apartment living in Chennai and giving rise to a unique personality, Sarvam is destined to keep you mesmerized with its charm. Surrounded by the comforts of urban living, these flats in Velachery boast of a living that is comfortable, pleasant and contemporary. Neighboring the IT corridors, entertainment zones and all essential amenities, you are assured of a lifestyle that is a unique portrayal of your desire. Style with substance, attention to detail and an inspiration from sensations makes this place an adorable address. 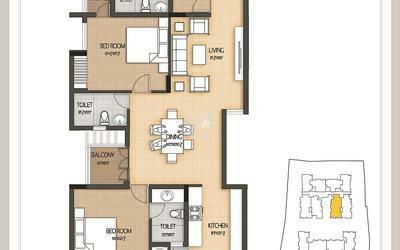 With 203 apartments ranging between 1483 sq. ft. and 1661 sq. ft. with options of 2 BHK & 3BHK every home at Sarvam is spectacular and admirable. Attention to details that make your living pleasurable and unique, Sarvam is indeed a living that is crafted for comfort. Raft foundation and framed structure. Thick solid concrete blocks of standard specifications, quality and brand will be used for block work. Vitrified tile flooring for the entire flat except toilet & utility. Designer tiling will be done for toilets as per architect's design. Tiling will be done up to ceiling bottom. Steps, lift, Facia, lobby, common wall – shall be as per architect's opinion to give maximum uplift of common area. CCTV for common areas with DVR recording facility at the security kiosk. Video door phone provision for each flat. 6 High speed elevators (4 passenger and 2 bed elevators) of branded company will be provided. Toilets: Hot and cold wall mixer, wall mounted white/pastel color EWC, White/pastel color wash basin (without pedestal), one tap. (non-movable parts like bottle trap, waste coupling etc.) Jaguar, Parryware, Hindware or equivalent CP fitting will be used. Utility: One tap with borewell water and provision for washing machine point. Angle valves: Will be provided for washing machine point, geyser and Aquaguard point. Ventilators: UPVC (Open able - top hung) – Fenesta or equivalent make. Windows: UPVC (Open able) – Fenesta or equivalent make. A/C provisions: Provision for split A/C's will be given inside apartment. Entire club house will be air conditioned. PUTTY WITH EMULSION FINISH: All internal walls of the flat including ceiling will be finished with 2 coats of putty and emulsion over one coat of primer. CEMENT PAINT: Lift well, lift machine room and common area ceilings. EXTERIOR EMULSION: External walls and Internal walls of common area as per architect's opinion. Concealed copper wiring of RR Kabel, Anchor, Havells or equivalent make with modular plate switches will be provided. Centralized cabling system for DTH and telephones will be provided. Wiring shall be done for lighting, 5 amps, 15 amps and A/c points in the apartment. Switches – All switches shall be Anchor, Roma or equivalent make. Common areas will be illuminated with sufficient lighting as per requirement. About S & S Foundations Pvt. Ltd.
S & S Foundations Pvt. Ltd. is one amongst the leading builders in Chennai with a heritage of almost a decade. Under the guidance of our Chairman, Mr. K. Sundararaj and our Managing Director, Mr. S. Sathyanarayanan, S&S Foundations Pvt. Ltd. has never seen a setback in delivering the best quality homes since its inception. One of the leading real estate developer in Chennai building landmarks around the major residential hubs. Ready to occupy 2.5, 3BHK Apartment in Velachery, Chennai inside the project S&S Sarvam offers best in class homes. 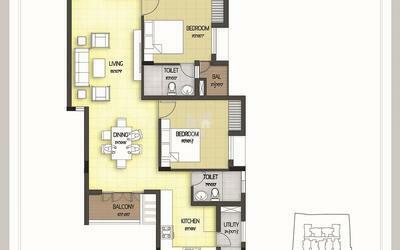 S&S Uni5 one of the project built with Ready to occupy 2,3BHK Apartments in Padi with a combination of both compact and luxurious homes. S&S Ishan one of the project built inside a CMDA Approved layout with ready to occupy 3BHK luxurious aprtments in Mylapore, Chennai. With an able management that can truly roll out red carpets of perfection, S&S Foundations Pvt. Ltd. has created landmarks of architectural opulence across the skyline of Chennai. Our values soulfully rely on our customers. We value them for their trust, dreams and expectations. We start sculpting our monuments of design and the customer’s belief on us makes our projects speak for its assured quality. The enormous dedication and complete concentration helps us to deliver the finest to our customers. S&S Foundations Pvt. Ltd. is blessed to possess a dynamic team that vibrantly works and passionately delivers. S&S Foundations Pvt. Ltd. is proud of its team which possess highly experienced professionals who are not just veterans in their building skills but also vibrant with their team work to deliver the finest quality of work with combined with lifestyle to surprise the customers eagerly look forward to it. Our team is our strength and our silver spoon of success. To create the finest colossal buildings that shall stand as landmarks of excellence forever and conjure up, meticulously carved architecture that meet the glossy demands of today. Seeking innovations from time to time and being futuristic in its approach to create not just livable residential projects, but mind-relishing magnificent buildings of unparalleled quality. With constant efforts, we resolve to deliver only the finely carved projects to our customers. It’s our aim to create a signature style in all our creations with a dynamic team with quality goals and unique talent.